At our house the Teddy Bears rule. This page is dedicated to them. The artwork on this and all of our pages is by Gail Gastfield. This is a non-commercial site. No products are sold through this site. Some images are printed as posters or other gift products, and information for contacting the manufacturers is listed with those images. All artwork is copyrighted and may not be copied or reproduced without permission of the artist. The Teddy Bear Times "Every bear's favourite magazine"
Paddington Bear This is the home of Paddington Bear on the web where you will find everything you ever wanted to know about the famous bear from Darkest Peru and his creator, Michael Bond. From Paddington Bear games to a Paddington Bear bulletin board, there is something here to please Paddington fans of all ages. Boyds Bears 100% o-fishull gen-u-whine website for the Boyds Collection. North American Bear Company home of Muffy Vanderbear®.Welcome to the whimsical world of North American Bear Co., Inc.! Our Classic Bear, Baby, Gift and Muffy VanderBear® Couture lines are noted for their distinctive charm and luxurious textures as well as their outstanding value, quality and safety. Vermont Teddy Bears has over 100 Bears that make the perfect gift for holidays and other occasions. Every Bear comes in a colorful gift box with a free personalized card and a chocolate treat. It's a great gift idea and a creative alternative to sending flowers! Show you care, send a Bear! The Great Teddy Bear Hug Sponsored by Brown Brehm Bears by award winning artist, Kelly Brown Brehm. Teddy Bear Directory This directory has been in existence for over five years now. It has been through many changes. It is changing again! It is now divided into two distinct areas - one for the Stores and another for the Artists. Steiff, the original German creator of the teddy bear. More than 1.5 million Steiff animals were produced over the last year. The main production facility is located in the German town of Giengen/Brenz.Over the years, Steiff GmbH has become the leading manufacturer of high-quality toys and collectors' items. Cute Teddy ecard site -- another teddy bear greeting ecard service. Disney Pooh, while not my favorite version of Pooh, here is the official Disney Pooh site. Good Bears of the World (GBW) is a non profit organization which provides teddy bears to children of all ages, where love, solace, and comfort can make a difference.Firemen, policemen, emergency workers, psychologists, and grief counselors have discovered the teddy bear's magical healing power on children and families in traumatic situations. Gund's official website for teddies and other plush. 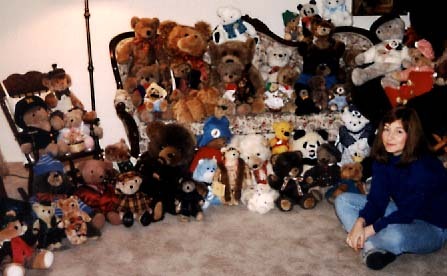 For more than a century, GUND has been creating Teddy Bears and other huggable toys recognized for their unique softness, quality and design. Founded in 1898 by German immigrant, Adolph GUND, making GUND the oldest plush toy company in the United States. One of the first to design and produce Teddy Bears in the early 1900's. Britain's oldest teddy bear manufacturer. Hermann Teddy German teddy bear maker. The beauty and tradition of the Teddy Bear is timeless, as are the memories and traditions that follow. Cooperstown Bears is a compilation of historic relics, honored legends, and a little hope and dreams. Page art Copyright Gail Gastfield.